The Action Agenda is organized into five Sections. Section 1 is the Context for Recovery. It describes the 2020 recovery targets, the current state of Puget Sound relative to each target, and climate change projections. Recovery of shellfish beds – shellfish health begins on land through reduction of pollution from rural and agricultural lands and maintenance and repair of failing septic tanks. Funding Strategy, which describes how increased financial capacity to implement priority ongoing and new actions in the Action Agenda can be achieved through identifying new sources of funding, using existing funding more strategically and efficiently, and developing innovative, market-based programs. Section 4 contains local profiles and local strategies and actions. Local strategies and actions also are incorporated throughout Section 3, nested within the relevant Puget Sound-wide sub-strategies. Section 5 contains five appendices. Appendix F provides a Federal Response – Habitat Matrix; and Appendix G provides the Action Agenda Sub-Strategy Rankings. Finally, there are two companion documents to the 2012/2013 Action Agenda. 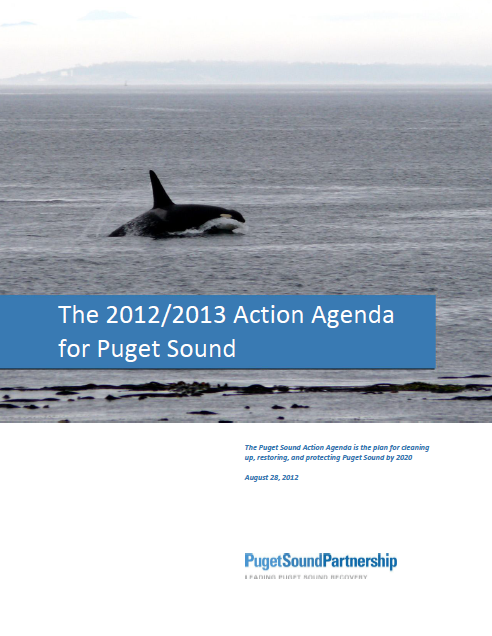 Highlights from the 2012/2013 Action Agenda, including the Strategic Initiatives, can be found in The Action Agenda for Puget Sound: Highlights of the 2012/2013 Action Agenda. Priority science actions are described in the Action Agenda’s companion document, Priority Science for Restoring and Protecting Puget Sound: A Biennial Science Work Plan for 2011-2013. It provides a strategic focus on the science needed to recover and protect Puget Sound.